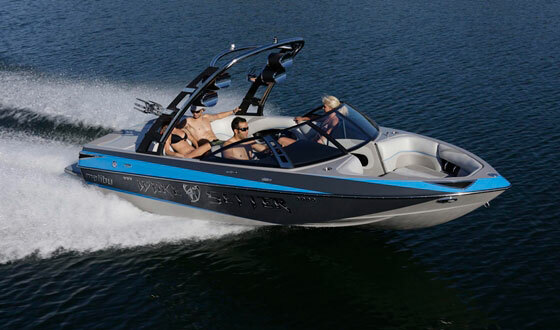 Some may say the Malibu Wakesetter 25 LSV is over the top; we’d just say it’s tops. Something akin to an arms race has been going in the tow boat market. Each year, tow boat manufacturers offer more and more features in an effort to one-up their competition. The results have been dramatic, and fun to watch. And expensive. Of course, touch screen displays, seat heaters, refrigerators, and ballast systems that can crank out wakes the size of actual ocean rollers do treat buyers to more than they ever could have imagined just 10 years ago. But all that equipment has come at a price. It wasn’t all that long ago that the first tow boat topped the $100,000 price point. 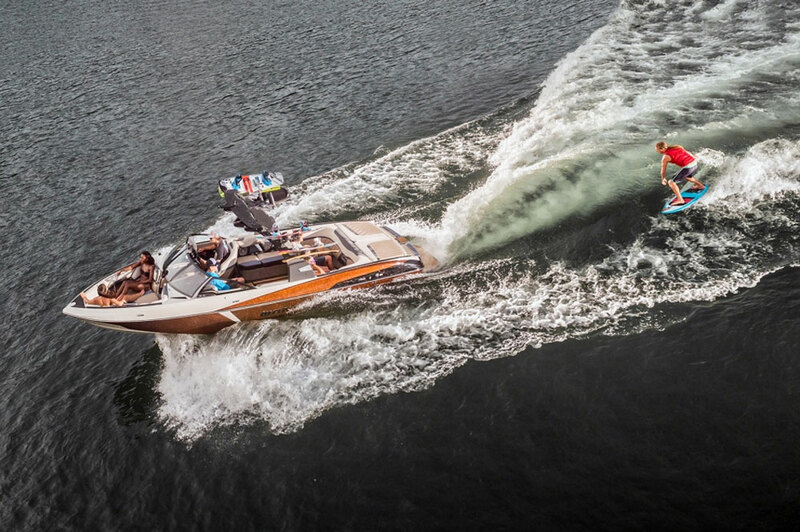 Now the market for tow boats has reached a new benchmark, in the Malibu Wakesetter 25 LSV. You want a wake surfing boat that has everything? 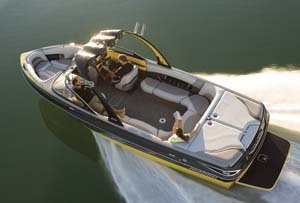 Check out the Malibu Wakesetter 25 LSV. From the looks of the 25 LSV, we’d say Malibu has hit the target dead center. The 25 LSV is as opulent and fully-featured a tow boat as you will find. More on that in a bit, but it’s also important to point out that this boat is designed to put out the biggest surf wake on the market—and it has the gear to get the job done. For example, the 25 LSV weighs 5,600 pounds and its maximum factory ballast capacity is an additional 4,285 pounds in four tanks located strategically throughout the boat. There’s also a plug-and-play ballast system available from Fly High that’s custom-fitted to the 25 LSV, and the boat is pre-plumbed to accommodate the additional ballast bags. 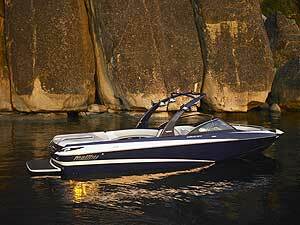 The 25 LSV comes with an integrated surf platform and some proprietary Malibu gear like the Power Wedge, and its Surf Gate system. Power Wedge provides 1,000 pounds of down-force without a single ounce of added weight. 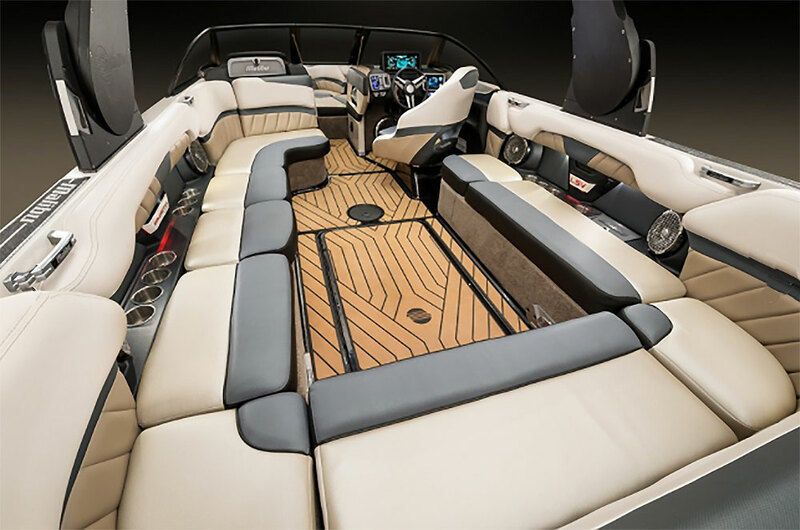 To make things easier on the driver, the boat comes with hydraulic steering and an optional backup camera that displays the rearview on a 12-inch touch screen display when reverse gear is engaged. The driver also can turn on the camera at will. The system has 12 preconfigured settings for beginning, intermediate, and advanced surfers and wakeboarders. When the day is done, the “go home” button drains all ballast tanks, lifts the wedge, and pulls in the surf gates automatically. The driver looks over twin touch-screen displays that control all the functions of the boat its the vital signs. He or she can adjust the settings using the screens, via a smart phone, or via the Sport Dash control to the left of the wheel. Combining the boat’s most-used functions, Sport Dash controls the Surf Gate, the Wedge, GPS-controlled boat speed, and the stereo. Adjacent to the Sport Dash controller is a holder that will accept phones of virtually any dimensions. Inside, the Malibu is as tricked-out as they come. Note the multiple touch-screen displays gracing the helm station. 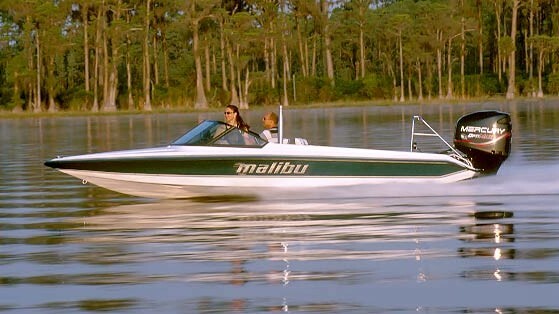 For the rider, Malibu offers the Surf Band, a wireless wrist-worn device that can control the Surf Gate and Power Wedge systems, and also the boat’s speed control system. So there are no undue surprises, the driver is alerted to the changes via an audible signal and a visual cue on the dash display. A G3.2 tower is standard, with an option to upgrade to the G4 tower. Other options include the Surf Band wrist device, a Power Wedge II, the rearview camera, and mounts for action cameras. Buyers also can get a power adjustable helm seat, the “wake view” rear seat (which lifts up from the aft lounge to create a rear-facing bench), fender locks, drain plug sensors, underwater lights, and the Sport Dash system. At this price point, we wish things like the Power Wedge II, the Surf Band system, rearview camera, Sport Dash, and mounts for action cameras were standard. So, just how much will a super-uber ride like this cost? You can expect to pay around $200,000 for a Wakesetter 25 LSV. Ultra premium, indeed. 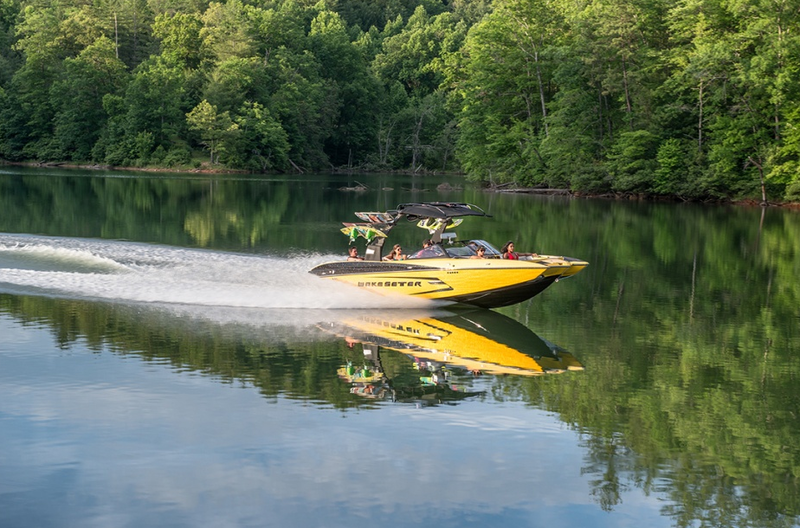 Other Choices: Another top-of-the-heap watersports boat is the Mastercraft X26, which starts at $150K but quickly climbs past the $200,000 mark as you add options. 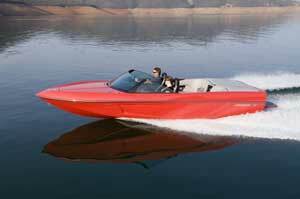 The Super Air Nautique G25 is a slightly less expensive nuclear option, with a starting point of $135,000. 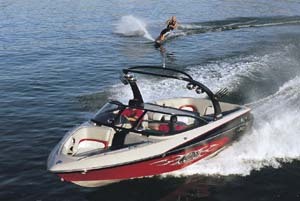 See Malibu Wakesetter 25 LSV listings.